The 5,300 SF space consists of a high-tech conference center, creative collaborative spaces, and other building tenant amenities. Unique features include concrete countertops, stunning wood doors, distinctive light fixtures as well as a custom light piece in the open area, multi-color paint scheme, partially-exposed ceilings with clouds, high-end finishes and back painted glass throughout the space. Technology is a centerpiece of the newly upgraded conference center. Meeting rooms include state-of-the-art technology and custom A/V built into the walls. Conference room wood doors are power operated and tied into the existing fire system. The meeting rooms have floor boxes built in to support wireless connectivity. One of the main rooms also has a power-generated partition wall to enable the room to be split into two separate rooms. The space also includes TVs throughout for ease of projecting and sharing information with tenants and visitors. 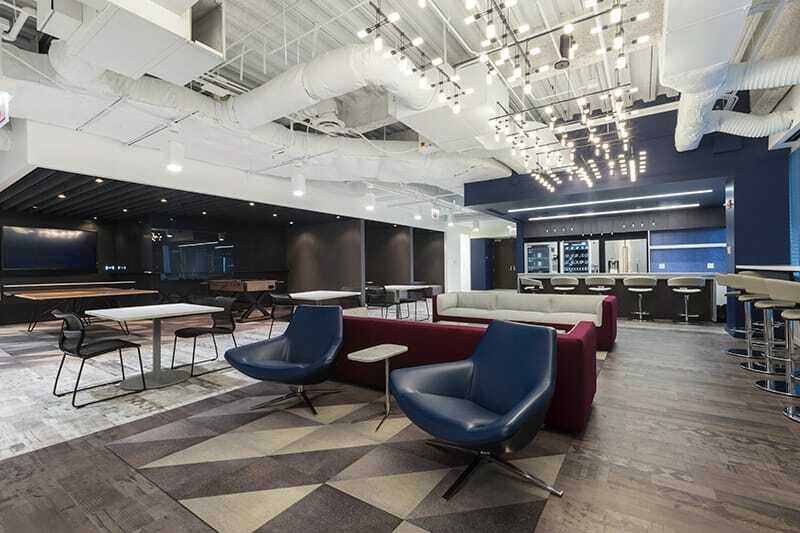 One of the coolest aspects of this office renovation is the collaborative spaces provided to building tenants and conference center visitors. Along the windows, high tables are available for work spaces and impromptu meetings, giving it a coffee shop/bistro feel. Felt-covered huddle spaces are also available in the conference center. The felt in these alcoves doubles as a place to hang items as well as a sound barrier for additional privacy. 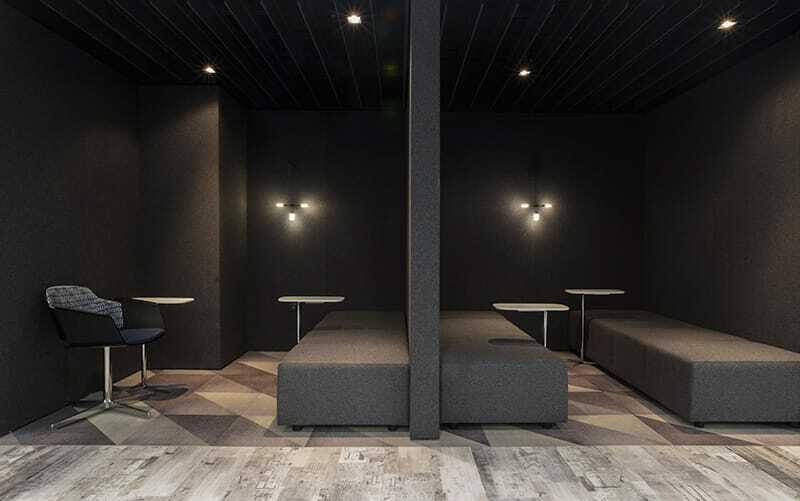 The common break area promotes collaboration and facilitates connectivity among the building tenants. The space includes foosball and ping pong tables for casual gatherings and also includes a fully upgraded kitchen with stainless steel appliances available for tenants. 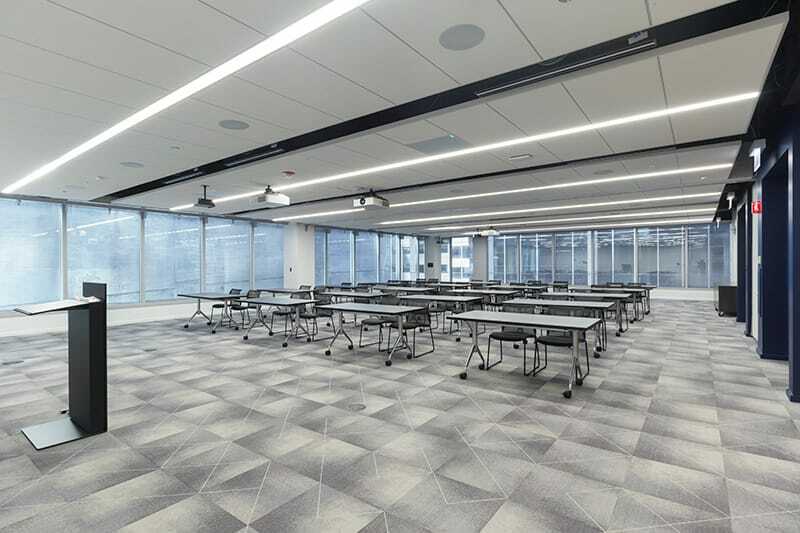 Gilbane’s Media Studio provided the client with visualization services and developed a virtual walkthrough of the new conference center space to attract potential tenants.